Welcome to the Pale Gray Dot - Thoughts From The Frontline - Investment Strategies, Analysis & Intelligence for Seasoned Investors. In February 1990, the Voyager 1 space probe reached the outer edge of our solar system. NASA commanded it to take a last image of Earth from 3.7 billion miles away. The planet is only a small speck from that distance. Seeing that image, Carl Sagan profoundly called our home a “pale blue dot” in the vastness of space. Since then, we inhabitants of that pale blue dot have been turning gray at a rapid pace. The resulting demographic changes may appear insignificant against the backdrop of the cosmos, but they are increasingly visible here at ground level. The aging of the world’s population is already having profound effects on the global economy, and it is only getting started. Today we’ll consider those changes, drawing partly from research conducted by the intrepid volunteers for the demographics chapter of my new book. It is important to understand the profound shift in demographics that is going to cause sweeping changes over the next few decades. Those changes will broaden the scope of our study of economics and investing; they will alter our understanding of sociology; and they will radically affect politics and governments. Precisely what these changes will be is difficult to discern and predicting them requires some guesswork, but the one thing we don’t have to guess about is the demographic shift itself. Everyone who will be over 20 years old in 2035 has already been born. Moreover, birth rate trends don’t tend to change radically but evolve slowly. We’ll begin with the big picture. Experts think global human population first hit 1 billion around the year 1800. The next billion took another 120 years, arriving in 1920. It took only 40 years to add a third billion, by 1960. From that point the growth curve turned higher, and now we’re approaching 7 billion. What next? Here we enter the realm of guesswork. I wanted to begin with this chart because it shows just how widely the estimates can vary. 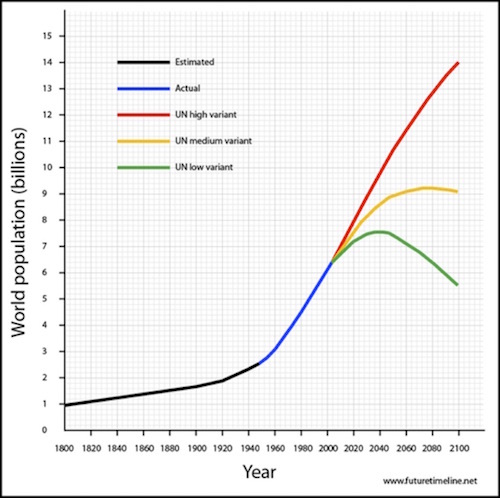 The UN’s “low variant” line shows human population peaking around 2040 and falling below 6 billion by 2100, while the “high variant” has the population at 14 billion and still rising in 2100. The gap between 6 billion and 14 billion is greater than the total number of people alive today. The gap is that wide because demographic projections require many assumptions. Most of them pertain to small changes in population, but they can combine to make a dramatic difference over time. Unknowable future events may also bend the population curve. Baby booms and busts, wars, famines, epidemics, medical breakthroughs, and more are all potential game-changers. The late-20th century acceleration in population growth was mainly a result of modern vaccinations. Other technologies could have – and I think will have – similar impacts in the future. Technology can cut the other way, too. We now have the capacity to wipe out entire nations and even the human race with nuclear weapons. Some scientists think our excessive antibiotic use will create drug-resistant superbugs that could kill millions. I don’t expect such events, but we can’t rule them out, either. For now, at least, we are making new humans faster than we are losing them. The result is a growing global population. But the growing total population masks the shrinking population in much of the developed world. Even as world population is increasing, it does not follow that every country and continent is growing at the same rate, or even growing at all. Presently we find the highest growth rates in sub-Saharan Africa and parts of the Middle East. 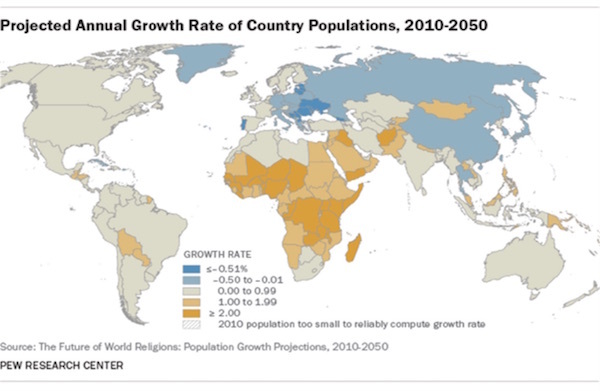 The lowest growth is in Eastern Europe, Russia, China, and Japan. Notice the countries shown in shades of blue below. They are actually shrinking in population. If you want your nation’s population to grow, you need a higher fertility rate and/or longer life expectancy. Africa has both those factors on its side, though fertility rates are beginning to decline there, too. Globally, the combination of falling fertility and longer lifespans means that the population is slowly growing older. 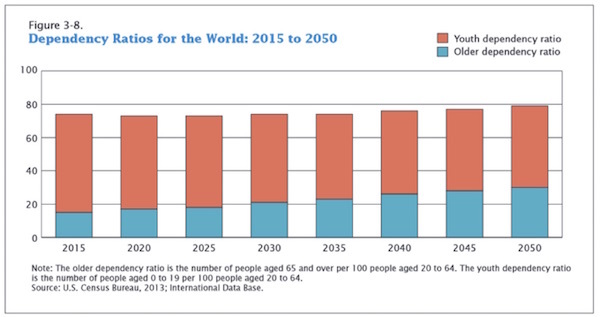 This will bring something remarkable in the next few years: the world will shortly have more people over age 65 than it has children under 5. 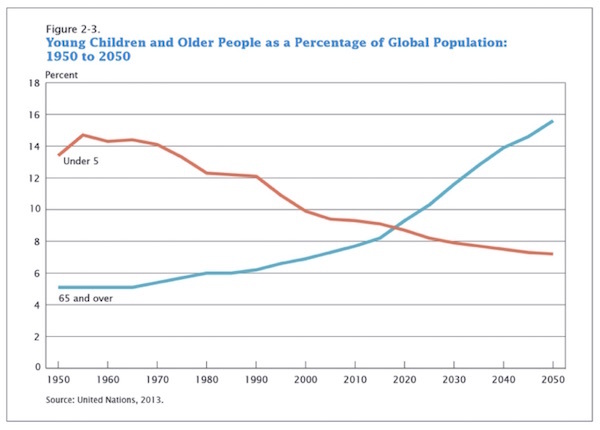 You can see in this chart of UN projections that the elderly population is growing much faster than the child population is shrinking. To use a scientific term, that’s really weird in the context of the last 10,000 years of human experience. The disparity between numbers of old and young will get worse, for the simple reason that (unlike interest rates) fertility rates can’t fall below zero. Meanwhile, our ability to extend life on the other end can grow considerably. The chart above comes from an excellent and very lengthy (175 pages) US Census Bureau report titled “An Aging World: 2015.” It is chock-full of interesting data that I can’t begin to summarize. You can read it yourself at the link if you want to get into the demographic tall weeds, a safari free of charge thanks to US taxpayers. Sadly, little else about this story is free of charge. The aging population dynamic means we will have fewer younger people supporting a larger number of older people. Consider also that children too need care, so the real problem will be lack of middle-aged people to support both children and the elderly. By 2050, for every 100 working-age (20-64) people, there will be almost 80 children and retirees who will require support. That sounds bad, but notice how little the ratio actually changes from now until then. The problem is that we have not arranged ourselves on the planet in neat, homogeneous groups. In fact, most of the children are going to be in Africa and the arc around the Indian Ocean while most of the retirees will be in the developed world and China. China’s one-child policy is creating an ugly, upside-down pyramid. Each worker in that generation in China will end up supporting two parents, four grandparents, and probably one or more of the worker’s own children, too. That is just not a formula for a successful transition to a more dynamic economy when more than half the population of China is still stuck in a subsistence lifestyle. Life at or near the Chinese coast is far different from that of the interior. 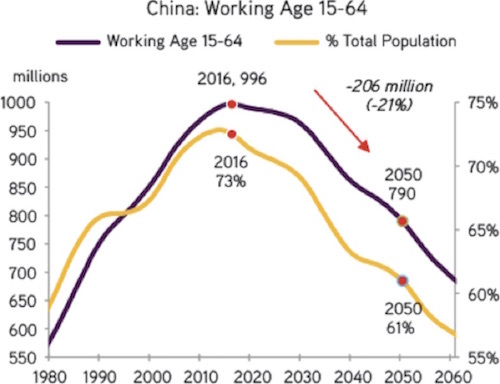 The demographic reality is that the working-age Chinese population almost literally falls off a cliff starting in the next few years. 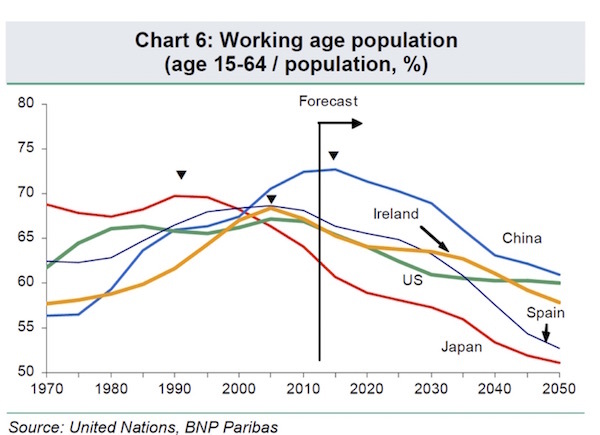 The first chart below shows working-age numbers in China, and the second chart shows China as compared to the US, Japan, Ireland, and Spain. Notice that China still has a higher percentage of working-age people than the other countries do, but these other countries have grown relatively rich before they have grown old. China does not have a Social Security program or anything close to the safety nets that have been created in the developed world. The Chinese are known for their propensity to save, but if you are part of the one half of the nation that exists on a subsistence income, you find it really hard to save. I’ve said this before, but it’s worth repeating: “retirement” is a new concept. For most of human history, people worked as long as they were physically able and died soon thereafter. And in much of the world that is still the case. Traditionally, the intervening period between no longer being able to work and dying was longer for people who had large families to care for them – which is one reason fertility rates were so high. This state of affairs began to change in the 19th century when the advent of mechanized agriculture began to allow a farmer to feed his own family and still have food to sell. The work time of farm families was somewhat freed up, and more time could be devoted to helping the elderly to live longer. At some point, supporting retirees went from being a family responsibility to a task shared between family and society. Governments created programs like Social Security in the US that guaranteed some minimal income to older folks. Businesses did the same with pension plans. Families were still the backstop, though, along with whatever savings retirees had accumulated. Now that’s starting to change. By choosing to have fewer children, we unwittingly sawed one leg off that three-legged retirement stool. It’s hard to depend on descendents who don’t exist. Worse, the other two legs are starting to crumble, too. 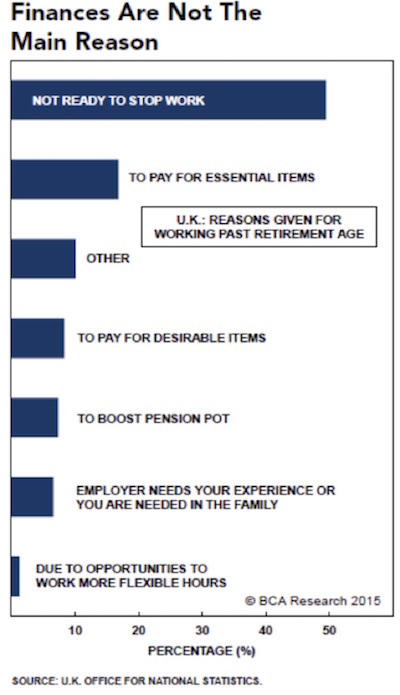 Defined-benefit pensions are rare in the private sector and unstable for government retirees. Individual investors tend to lose their money in market crashes and are often lucky just to break even. Even government plans like Social Security are in increasingly questionable shape. And the data in the US is pretty stark. The average savings of a 50-year-old is only $42,000. The average net worth of somebody between 55 and 64 is $46,000. A couple at age 65 can expect to pay $218,000 just for medical treatment over the next 20 years. Eighty percent of people between 30 and 54 believe they will not have enough money to retire. One in three people have no money saved for retirement at age 65, and almost 40% are 100% dependent on Social Security. And we wonder why Social Security is the political third rail? None of this is good news if you are approaching retirement age. Your stool is wobbly at best and possibly falling apart. That’s not comfortable. What do you do? The demographic statistics say I’m the exception. Most people don’t have seven children or the financial assets to support themselves through their retirement years. Many people will work past what we now consider retirement age because they have no other choice. Retirement planning will be a big problem in the developed world, where total population is shrinking. If this challenge is anything like those of the past, technological and entrepreneurial solutions will emerge. However, for Japan those solutions are not showing up fast enough to help their radically aging population. Kodokushi or “lonely death” refers to the Japanese phenomenon of people dying alone and remaining undiscovered for a long period of time. First noticed in the 1980s, kodokushi has become an increasing problem in Japan, attributed to economic troubles and Japan's increasingly elderly population. It represents upwards of 5% of total deaths – about 30,000 people a year. Before you reach for the razor blade, there may be better answers. At Rob Arnott’s conference last month, I listened to a presentation by Alicia H. Munnell, a Boston College economist who was previously Assistant Treasury Secretary in the Clinton administration. Workers aren’t saving enough money for the retirement income they’ll need. They need more than they think because they are living a lot longer. Retirement age is rising, but not as much as life expectancy is. Retirees also need more because healthcare costs are high and rising. Low interest rates reduce what retirees can withdraw from savings. 401(k)s aren’t working for most people because people make mistakes. Munnell offers three solutions that she calls “straightforward.” They are that, but they aren’t what I would call easy for most people to wrap their heads around. Work longer to build assets and shrink the retirement period. Save more via Social Security and employer plans. Consider the house as a retirement asset. On the first item, she makes a very interesting point that I haven’t seen anywhere else. You can work longer and still enjoy retirement as long as your parents and grandparents did. Assuming you started work at age 20, rising life expectancy means that if you retire at age 70 in 2020, you will have the same work/retirement ratio as someone who retired at age 65 in 1940. My generation is enjoying better health in our later years than our parents did. We work longer simply because we can and because we enjoy it. By Munnell’s calculations, simply working until age 70 will do the trick for most people. The extra working years will give your savings more time to accumulate. Your Social Security benefits will also be higher once you do retire. Now, I can punch all kinds of holes in this logic. We’ve already established that most people’s self-managed retirement assets don’t grow as they should because people make investment mistakes. Also, there’s no guarantee Social Security will keep awarding higher benefits to people who delay retirement. Further, people with health problems or physically demanding careers might not be able to work until 70, or even 65. I think Munnell would acknowledge all these points. She goes on to say we should shore up Social Security by raising payroll taxes. She thinks an additional 2.68 percentage points of tax would do it. She also suggests investing some Social Security assets in equities. Another plank in her plan would see 401(k) plans made automatic and mandatory. But while I acknowledge paying for the growing Social Security and entitlement benefits that are already on the books is going to require more tax revenue, it is not clear that increases in taxes are going to be easy to achieve. Further complicating the script is the possibility that throughout the developed world we’ll see something like a generational conflict in which young people resist being bled to pay for the comfortable retirement of the elderly. But the elderly vote en masse, and that is not something that younger people typically do. That said, voting trends can change. Munnell’s last suggestion is to use the house as a retirement asset, either by selling and downsizing, or by getting a reverse mortgage. Fair enough. The retirement problem is not just a US issue. Much of Europe is going to be going through dramatic changes in their entitlement and retirement programs as budgets and debt get blown out in the coming five years. Ask a retiree in Greece how life is going. Greece’s situation is going to be visited on more than a few countries in Europe. And if the United States doesn’t get its fiscal act together, sometime in the middle of the next decade a very nasty reality will come crashing down upon us. Last week I ran across another study that brought up a new point. We all know that the figures on life expectancy are averages. Any given person will probably live longer or die sooner than average. Some factors are within our control; others aren’t. On the other hand, is it really a surprise that people with lots of money live longer? They tend to have healthier diets, get better healthcare, have more immediate access to emergency healthcare, live in safer neighborhoods, and avoid hazardous careers. I’m surprised the difference is only 2–3 years, frankly. I’m not sure anything a government can do can change this. If one (admittedly favored) group can, in just a little more than a decade, add 2–3 years to its lifespan without consciously trying, imagine what concerted efforts could do. Such efforts are underway right now in labs all over the globe. It is perfectly reasonable to think that the next decade will bring advancements that add many years to our lifespans. Medical cures for obesity, heart disease, and cancer are all foreseeable within the next 10 years (though lifestyle will continue to be an issue). Advances in medical biotech will lead to a radical extension in lifespans – and healthspans. As with all new technologies, these will be expensive at first. They won’t be instantly available to everyone, everywhere. But neither was penicillin, or the polio vaccine, or heart transplant surgery. They took time to spread. I expect life-extension technology to propagate faster, though, for the simple reason that it makes economic sense to keep people alive and productive as long as possible. This will be doubly true in a world with fewer young people. Further, much of the new life-extension technology is going to have the same scalability as digital technology has had. We all know how phones and computers get better and cheaper. Medical care is beginning to ride the same technological wave as our favorite digital devices. That formula obviously won’t work – but it won’t have to if we can make tomorrow’s 80-year-olds as healthy as today’s 60-year-olds. 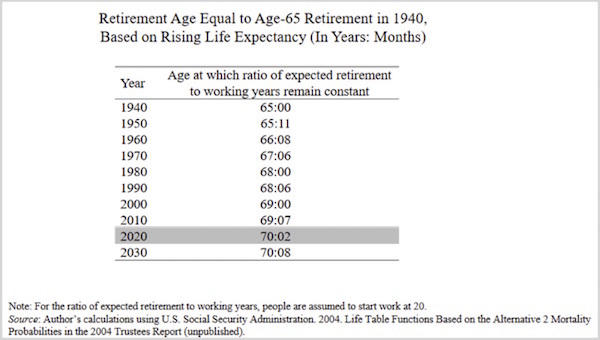 People might be able to keep working until 85 and be happy about it. Let’s turn back to long-term population growth. If fertility trends continue, I can foresee a day when most of the world will be reproducing at below-replacement rate. Total population will have to peak at some point and then begin to fall. Economics is the study of scarcity and how we manage it. For centuries we’ve managed it by having more babies and putting them to work. That era may be ending soon. Then what? In a world with a static amount of goods and services and a shrinking number of people to buy them, the natural response will be falling prices – deflation, in other words. Is that where we are headed? That may just become the case in the developed world. In the developing world we’re going to see three billion more people enter the middle class over the next five years. They are going to want to buy refrigerators, cars, better food, more online access, etc. etc. Won’t prices be rising? Maybe. We may find that technology gives us an ever more abundant world. Or we may find that technology gives us new ways to spend our money, soaking up whatever excess supplies the robots build for us. Some science fiction writers imagine a world where even the robots are consumers. One thing is certain: life here on the Pale Gray Dot will change considerably in the coming decades. I will be speaking in Dallas on April 28 for the 14th annual Commerce Street Bank Conference. Then the next week I will again speak in Dallas for the seventh annual Inside Retirement conference, May 5–6. They have a great lineup of speakers, but I am most excited about getting to hear and maybe even talk with my personal writing hero, Peggy Noonan. I will admit that I’m a total fan boy of anything she writes. And her column this week was outstanding. She writes about “The Moment When 2016 Hits You.” Anyone who has been observing the political scene – and particularly with a sense of history – knows we are in a period of real political upheaval. We have lost our anchor, which might be a good thing given the fact that we were going nowhere fast, but now we are going full steam ahead into uncharted waters, and both major parties must regroup. Then on May 10 I fly down to Houston to speak at the S&P Dow Jones Art of Indexing conference. The conference is for financial advisors and brokers who are trying to understand how to manage risk while maximizing returns in the current environment. I will be in Abu Dhabi the third week of May and then come home and almost immediately go to Raleigh, North Carolina, to speak at the Investment Institute’s Spring 2016 Event. I’m looking forward to hearing John Burbank and Mark Yusko (who will also be at my own conference the same week) and then being on a panel with them. Afterward, I make a mad dash for the airport, arrive back in the Dallas late Monday night, and make final preparations for my Strategic Investment Conference, where upwards of 700 of my closest friends will gather to discuss all things macroeconomic and geopolitical. It is really going to be a great week! If you won’t be going to the conference, you can have the next best thing: recordings of the speakers, delivered just a few days after SIC 2016 ends. You can order your set here. As I have been writing about the problems of demographics and aging and composing a forward for Patrick Cox’s book, I’ve been thinking about my own personal journey into aging. I will turn 67 later this year, and I have to confess that I feel much better than I expected to when I contemplated being 67 a couple of decades ago. Part of that is a healthier physical workout and diet regimen than my parents and their generation had, and part of it is the cocktail of supplements and nutraceuticals that Patrick Cox has discovered at the very bleeding edge of bioscience. You won’t see those goodies in any hyperbolic ad promising you amazing results in one month, but the stuff coming down the road within the next five to ten years will be amazing. I know that so far nobody has gotten off this planet without dying. But as I said earlier, my genetics and lifestyle should get me into my mid-90s. I think the biotechnological breakthroughs will get me into my hundreds and with a relatively robust healthspan. And I optimistically tell myself that I have about a 1% chance of making it to 150. Yes, you scoff, but if you looked at the science as I have, you’d agree that I might actually make it. I think my children have a better than even chance of getting to 150. The question is not whether we will be able to regenerate new organs – I am 100% convinced that will happen within the next five years, and then we will see a cascade of new restorative processes. The question is whether researchers will be able to get all of the “critical path” organs into a state of rejuvenation in time. For a number of organs, there is a clear path to getting new stem cells into them so the renewal process can begin. For other organs, it’s a head scratcher. It will be a few years before we begin to test the first processes on real people, and my guess that will happen in Japan, since they have the most enlightened rules about using stem cell procedures. I wonder how much Tokyo apartments will be renting for in 10 years.